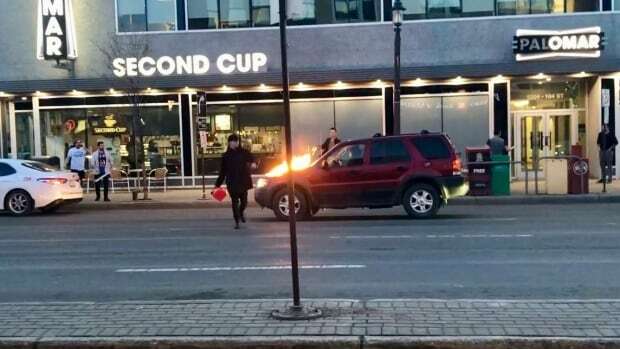 Before being tackled to the ground in an Edmonton Starbucks, a man who allegedly lit 13 vehicles on fire moments before had one request for the baristas: a grande macchiato. “It was kind of in a sarcastic tone,” said Maxwell Putnam, a lawyer who was enjoying a latte inside the coffee shop on Whyte Avenue and Calgary Trail. It was around 8:40 p.m. Friday. Putnam was sitting near the front window as a man beside him showed off the new Batman comic book he’d just bought. They looked out the window and saw an SUV, flames shooting from the hood, driving down Whyte Avenue. Moments later, a man dressed in black burst through the door of the café. He was being chased by three people, Putnam said — a moustached man in a Hawaiian shirt, a man carrying what appeared to be a 2×4 piece of wood, and another man recording the whole thing with a cellphone. The suspect burst through the door, barked his coffee order and seconds later, was tackled by the man wearing the Hawaiian shirt, Putnam said. The patrons inside watched as one of the baristas called police. In a video recording of the incident, a woman near the window sips her coffee, slowly stands up and walks away as the suspect writhes on the ground behind her. Police showed up within a couple of minutes, Putnam said, and the suspect was taken into a police vehicle out front. Video circulating online shows a man walking near the intersection of Calgary Trail and Whyte Avenue, carrying a jerry can and dousing vehicles with gasoline before lighting them on fire. Many people emerged from nearby bars and restaurants, one wielding a fire extinguisher. No injuries were reported, Edmonton Police Service Spokesperson Carolin Maran said in an email. Thirteen vehicles were damaged, she said. The suspect has not been identified, but is in custody.